GEN3 Electric (215) 352-5963: How Well Do You Understand Your Home’s Electrical Service? How Well Do You Understand Your Home’s Electrical Service? Is your home feeling neglected? GEN3 wants to reconnect you with your house by making you aware of some elements that may need attention for safety and efficiency purposes. Also, we know that if you are aware of these potential electrical hazards and, therefore, proactive, you could save you money and frustration in the long run. GEN3 provides our customers with educational materials so homeowners are informed and confident. We know that trust is earned. 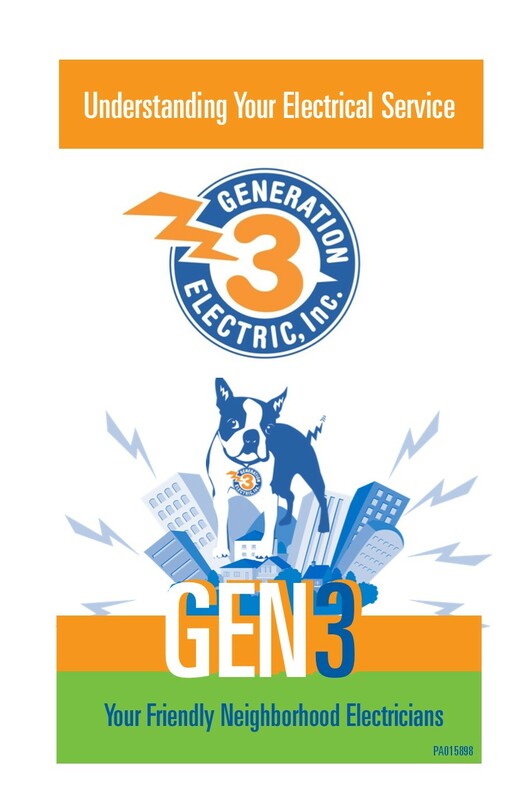 Whether a homeowner uses GEN3 or another electrician, we want to make sure that our Philly neighbors are safe and feel that they are getting their money’s worth from their electrical or lighting installation or repair. Isn’t that what a friendly neighborhood electrician should do? OUTDOOR ELECTRICAL EQUIPMENT – How do you know where the electric company’s responsibility ends and your responsibility begins? Be sure your outside electrical equipment is standing up to weathering and old man time! PANEL INSTALLATION STANDARDS – Short cuts may be ok when trying to get around traffic but not recommended when it comes to updating, servicing or installing your electrical panel. Understand how to ensure quality of service of the electrical equipment in your home. WHAT & WHY’S OF GROUNDING – Obviously, grounding is important for safety purposes including shock prevention and fire, but did you know that proper grounding can protect other expensive items in your home, for example computers, appliances, tv, stereo systems, etc. OLD verus NEW CIRCUIT BREAKERS – Older style breakers do not detect potential arcing as do modern AFCI circuit breakers. This is important because the more modern a home and products used by homeowner’s, the more up-to-date the power source needs to be to meet the updated demands of consumer electronics. EQUIPMENT THAT IS OVERDUE FOR REPLACEMENT – Do you like scavenger hunts? Unfortunately, you may not find treasure on GEN3’s scavenger hunt. If you have old stickers on some of your electrical equipment, then you can bet that the equipment is just as old and outdated. GEN3 can provide images of old equipment labels to help you go on a scavenger hunt around your home to identify the old equipment that may need updating! Let GEN3 repair the neglected relationship you may have with your house. With this type of valuable knowledge, you will feel better about implementing preventive maintenance strategies and making decisions to repair and/or replace old, neglected electrical equipment in your home.